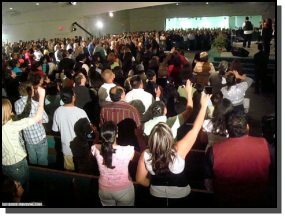 In 1987, when the Lord opened the door for us to come to the United States of America, He told us to stir up the churches, to get them on fire for God, so they would be stirred to win the lost. Jesus paid, on our behalf, the highest price a person can pay—the laying down of His own life. If we desire to take advantage of all His sacrifice bought and paid for, then we owe it to Him to be faithful only to Him—for Him to remain our first love. Only then, will we fulfill God’s wonderful plan for our life. An article was published in Charisma magazine (Read) about the Great Awakening. Since Feb 07, when the Great Awakening Tours began, there were at the time of this article appeared, more than 950,000 decisions for Christ. That figure, as of June 4th, just surpassed the 1 million mark. That's an amazing amount of people who have prayed the prayer of commitment. Charisma allows people to comment on the articles and there have been some skeptics, but most are very positive about the whole outreach. Some of the objections or skepticism is the huge number of souls saved. It would seem to many Christians that it is not possible for God to save that many. It is quite biblical however to see masses come to Christ. In Acts 2 there were over 3,000 decisions for Christ. In Acts 4 there were 5,000 converts in one day. So I guess Dr. Luke, the writer of the book of Acts must have been given to stretching the truth. 1.48 souls per soul winner per mth. The meetings started in Feb 07 so that gives us about 27 months. So lets take the total number of souls divided by the number of soul winners divided by the number of months. That is quite amazing. The church has crept into it's shell so much that very few Christians even believe that there are thousands waiting to surrender their lives to Jesus. If every Christian in the USA and the world could go out under the direction of the Holy Spirit and win 1.5 souls for Christ every month, we would see a growth explosion in the Church. I believe the Great Awakening Tour is doing much more for the Body of Christ than we realize. When you see the testimonies of the soul winners (harvesters) it will inspire you. Like the man who has been saved for 30 years and never witnessed to a soul the entire time. But in one day leads 30 people to Christ and now the bug has bitten and he cannot wait for the next day to go out again. You can watch about 15 video testimonies on YouTube by clicking here. Or you can go to http://youtube.com and search for rmigat and you will see the 15 testimonies. If you watch any, you should watch the following three. Great Awakening Tour in those cities. Phoenix, Arizona There were over 600 churches participating in the outreach to the city and the RMI team with Dr. Rodney Howard-Browne met at five different locations across the city. With over 2300 on the team going to businesses, homes, frail care and retirement facilities, and in the streets. At the time of writing this article, a total of 46,000 decisions for Christ have been made. Read the article here. Oklahoma City, OK The RMI team arrived on Wednesday and began training harvesters (soul winners), and by the time the meetings started on Sunday night, a total of 92 harvesters, visiting businesses, houses, old age homes and elsewhere, had led a total of 6,670 people in the prayer of salvation. West Palm Beach, FL There were 895 people who attended the soul winning training sessions and went into the streets, businesses, and retirement homes to witness to whomever God led them to. In total, including the nightly altar calls, 31,611 people gave their lives to Christ. Have you seen the image of Jesus on the roof of Revival Ministries International headquarters in Tampa Florida. Take a look at this unique phenomenon by clicking here now.